Earlier today I had the opportunity to present my paper, “A Historiographic Analysis of Visual Texts: Reviewing Information Graphic Methodologies as a Means of Historical Argument” at the Annual Meeting of the American Association for History and Computing at Brown University, Providence, Rhode Island. My presentation, which I also gave at the 4th International Conference on the Book at Emerson College, Boston, on October 21, 2006, covers much of the material in the paper. But the presentation covers material not included in the paper and vis-versa. Because the presentation includes material analyzed since the article's publication, I wanted to include some that material here. In the text, I expound upon the information design techniques used by the National Geographic (NG) in their coverage of the Civil War. Since that early analysis, NG has once again produced a marvelous example of argumentative information design. 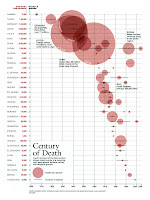 With "Century of Death" (January 2006) NG presents a clear and concise picture of genocidal activity in the 2oth century. In the classroom, I often have trouble impressing the magnitude of the Nazi Holocaust, Stalin's purges, or Mao's Great Leap Forward. But here, in simple black and red, the chronological order, duration, and scale of the last century's genocides are laid bare and easy to weight relative to one-another. And rather than diminishing the cost of the more recent Rwandan or Kosovar genocides, the result is a continuity of death. What is more, the multivariate visual text provides the samples quantities, making the diagram explicitly quantifiable as well as relatively so. One piece that escaped the presentation, however, was my discussion of Jonathan Riley-Smith's maps of the First Crusade. In my presentation I focus on examples of good visual texts. But Riley-Smith’s map, “Recruitment for the First Crusade, 1095-1103,” (in The First Crusader, 1195-1131) a visualization of copious quantification of 791 certain, probable, and possible crusaders, nonetheless fails to communicate a sophisticated visual argument. But Riley-Smith fails to ask many of the related questions about why these people went on crusade. This is surprising because his other works have addressed these issues. For instance, in The Atlas of the Crusades, edited by Riley-Smith, multiple recruiting centers and the recruitment campaign for the First Crusade are graphically depicted across a map of medieval France. And while this map also falls short of becoming a rich thematic map, a simple combination of this information with the demographic scholarship depicted “Recruitment for the First Crusade, 1095-1103” would help build a more sophisticated argument for the impact of crusader recruiting. The conference in Providence went well. My work was well received and I was glad to see others working on related issues of historical visualization. I was also glad for my first post-thesis vacation (as part of my introduction, it was mentioned that I defend my thesis on Wednesday ... the collective gasp filled me confidence ... no, what's the opposite of confidence? Less fear). I sat on the green at Brown among the worst frizbee throwers I've ever seen and read my first fiction book in about two years, careful to cover the spine so that none of the Ivy-leaguers would laugh at the menacingly large lettering, "Conan." I should also point out that, in my wanderings around Providence, I was delighted to discover the Rhode Island School of Design just down the hill from Brown. I had considered applying to RISD as an undergrad (before I decided against a career in the arts...oh...) and found it's artistic halls a pleasant respite from the hemp-smoke shrouding Brown atop the college hill.